Yesterday was our 39th wedding anniversary. Checking online, there seems to be some disagreement as to whether or not there is a specific gift associated with 3.9 decades of matrimony. While there are a few mentions of lace being appropriate, there are more references that basically say that once you hit 25 years, you’ve been married long enough that you need to quit taking it so seriously and only shop for gifts every five years. Thirty-five years is jade, and 40 years is ruby. Thirty-nine years? You’re on your own. So it seems to us that since there are no rules, we’re free to do whatever we want, and damn the social consequences! So from now till forever, we’ve decided that the appropriate gift for 39 years of marriage is Hypalon and aluminum. Preferably something in a nice boat shape. 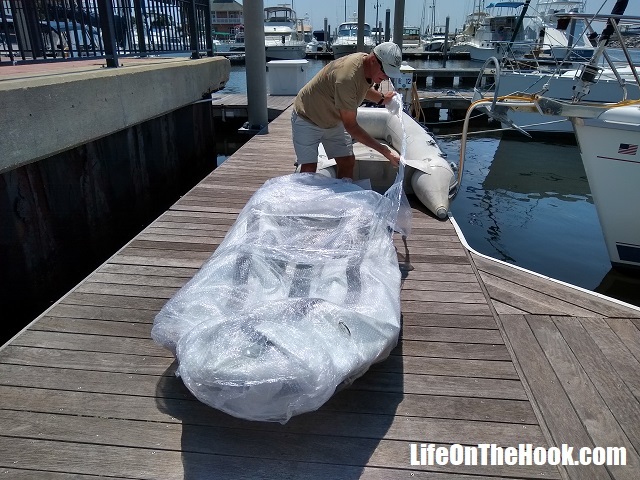 Unwrapping our anniversary gift—a West Marine aluminum hull Hypalon RIB. Man that’s a lot of plastic! Makes you wonder why everyone gets so worked up about plastic straws. Be free little dinghy! Pumping up our new baby. It’s Florida, it’s August, so yes, I’m sweating. But did you notice I’m pumping up the boat with the leg I broke back in January? Yay me! So light, clean and shiny! I’ll bet this thing is fast! 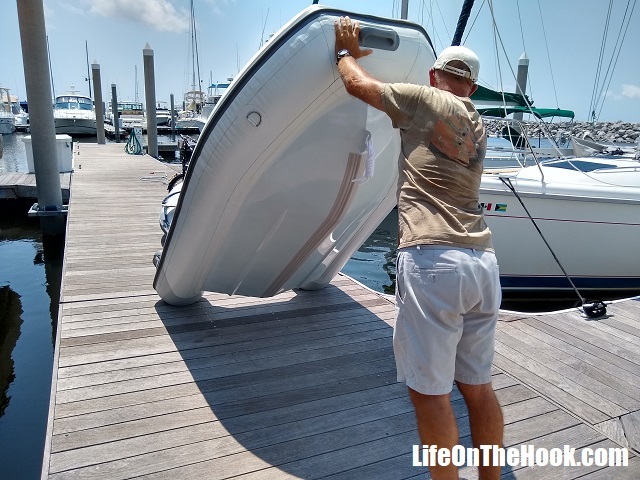 It just fits on the foredeck with no room to spare. A half inch longer and we wouldn’t be able to open the anchor locker. Thank you, West Marine, for your special 39th anniversary edition RIB! Just like parking a new car in the driveway. The neighbors stop by to see the shiny new boat. Old and new. After almost eight years, we’ll miss our old dinghy Eaglet. We had a lot of good trips together. But we just ran out of patience with crappy Mercury high pressure air decks. It’s a solid aluminum double hull for us from now on! So just a few specifics for those who care. 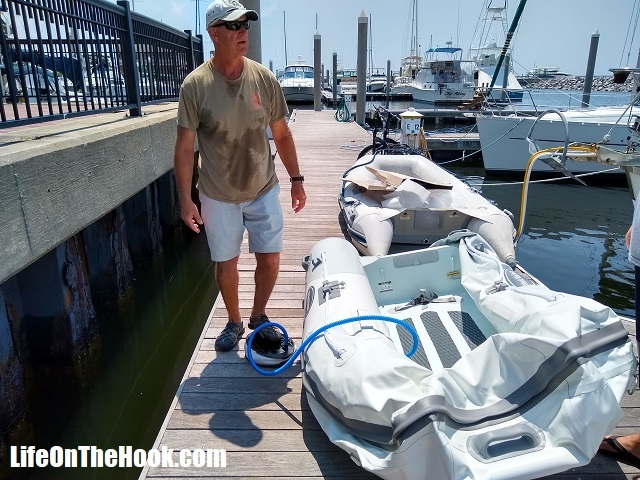 As we wrote about in our previous post providing a long term review of our Mercury air deck dinghy, we were just really tired of having to buy new air decks every year or two. We wanted a Rigid Inflatable Boat, or RIB, with a solid, deep V hull so that we’d never have to worry about a soggy floor again. Plus we can go faster. We learned down in the Bahamas that you really need a go-fast boat if you want to get around. With the long distances to cover, anything else is just a waste of time. 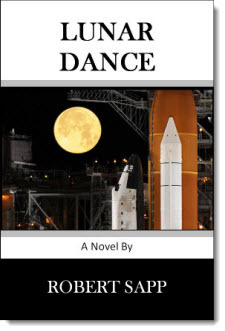 But we wanted a RIB with a flat interior floor and a covered bilge so that all our belongings wouldn’t be sloshing around in two inches of water constantly. That meant a double hull. Fiberglass double hull RIBs are heavy. 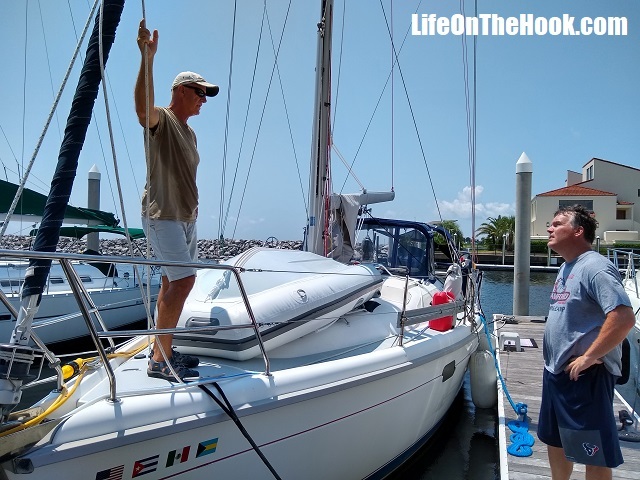 Since we lift our dinghy onto our foredeck for passages, weight was definitely an issue. Then we found out about aluminum hulled RIBs. The double hull models are quite a bit lighter than fiberglass ones. 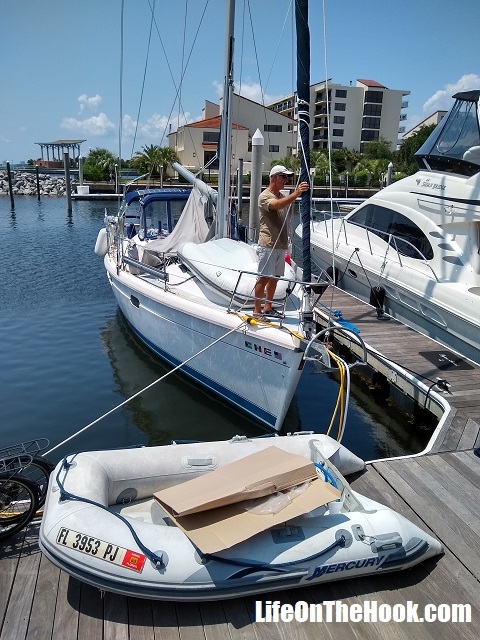 When West Marine marked all their boats down 30% in a recent one-day sale, and we saw we could save an entire boat buck ($1000) on a double hull aluminum RIB that was the perfect size for our foredeck, well, we jumped at it. It was our anniversary after all! This entry was posted in What? and tagged Aluminum RIB, Buying a dinghy, New family car on August 26, 2018 by Robert.